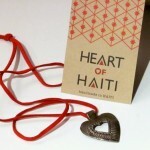 My Heart of Haiti necklace arrived in the mail today. What a lovely surprise to my Valentine’s Day. I can’t wait to wear it! See my post and read more about Heart of Haiti here.